New to crypto and hesitant to invest? Blockchain expert trying to hone your trading skills? Or a rockstar crypto investor? Whichever question you answered as yes, you can never go wrong with winning $1,000 by practicing your skills! Spare change investment app Coinseed is starting a 1-week trading competition this Friday. This is to kick off their new feature called Tournament. The contest has a prize pool of $1,000 and it will be shared among 10 people with the highest returns by percentage. The tournament will start on August 24th and will commence on August 31st. So make sure to join the tournament before this Friday! 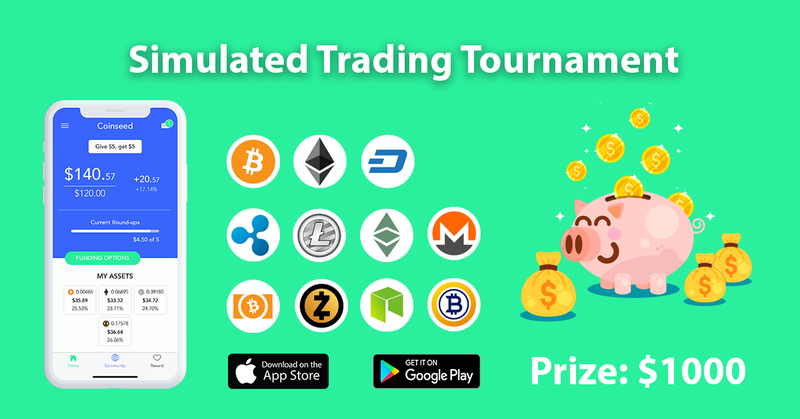 Going forward, Coinseed will host weekly tournaments in a similar fashion using their brand-new feature called, well you know, Tournament! Download the Coinseed app (available on Android and iOS) if you haven’t already. Signup for the Play Mode. This is a simulated trading environment. So you are not putting in any real money. Go to the Tournament tab and join the tournament. Actively manage your Play Mode investments for this coming week to win the prize! Note that you can put in up to $100 (not real money) every day but your performance is in terms of investment return percentage. So adding more “money” doesn’t increase your chance of winning but good return percentage will!